I wasn't going to jump onboard the "pineapple decor" bandwagon. 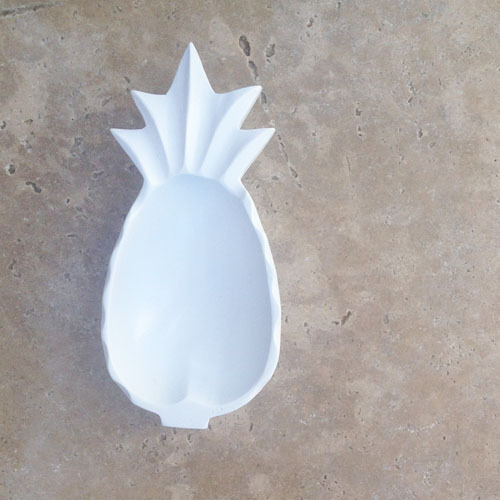 But then, on our trip to Kauai, I saw this 1970's designed pineapple bowl while perusing the Tourist Section at Walmart. You know that section? The one that all the locals avoid? I was fearless and risked my reputation for this!! I kid. Sorta… Anyhow, for 5 bucks, I figured I could indulge the trend. 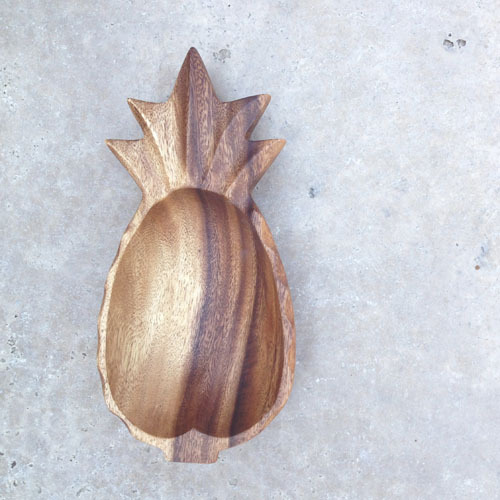 BTW, this bowl is made from pine, not pricey koa or monkey pod that some of the vintage pieces are made from. 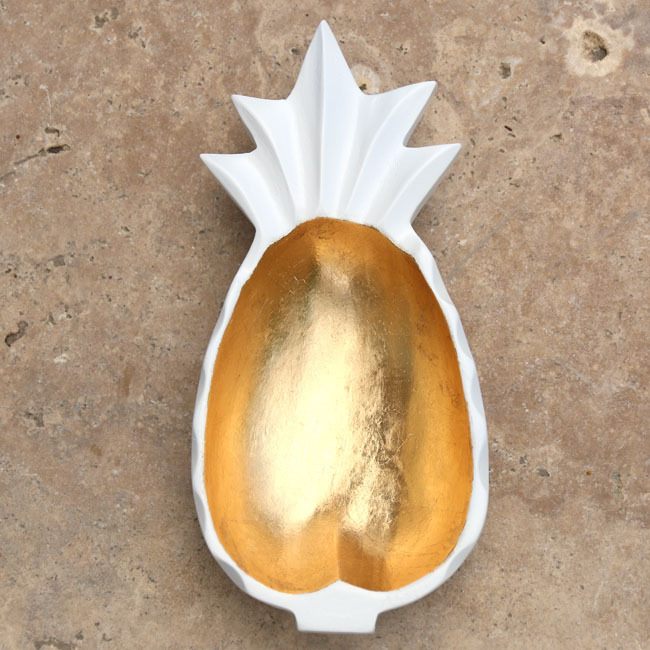 So while this pineapple bowl brings me back to the time of avocado shag carpet and orange formica… aah memories… I'm clearly someone who enjoys living in this century, and had no problem updating it with a little paint and bling. My only struggle was deciding on a design… Should I paint it on the diagonal? White with gold polka dots? Paint it all? Leave some wood showing? Gold leaf? Eventually Gold Leaf won out. I have a gold leaf kit that's been hiding-out in my craft supplies for the past year or two. Truth be told, gold leaf can be a little tricky to work with, so I put off using it until I had the time and patience. Well, last week I had the time and patience-- woot! Here's how my first attempt at gold leafing turned out. 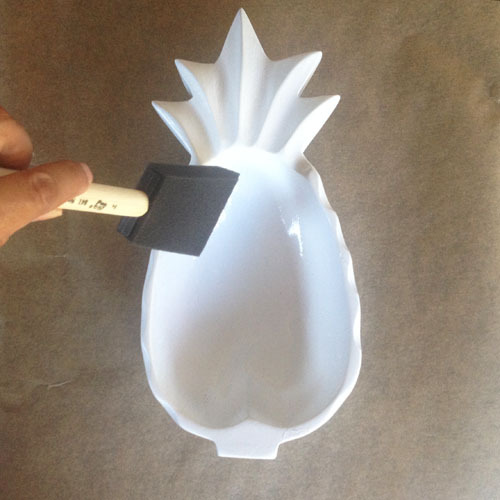 If necessary, lightly sand the bowl and remove any stickers. For size perspective, my pineapple bowl measures 4.75" x 10". Paint your bowl*. I used a white with satin finish because it's what I had on-hand. Let dry completely, usually 24 hours if you're using spray paint. *tip: if you don't want to paint, but plan on gold leafing raw wood or other porous materials, apply a layer of sealant first. The standard gold leaf adhesive is thin and white, almost milk-like. This works great if you want a smooth finish. Use a thicker adhesive if you're using a stencil. 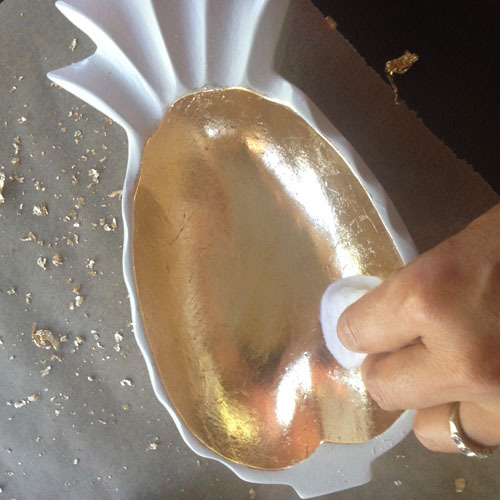 Brush on a thin layer** of adhesive to the part of the bowl where you want the gold leaf and let it set until tacky, usually 20-40 minutes. 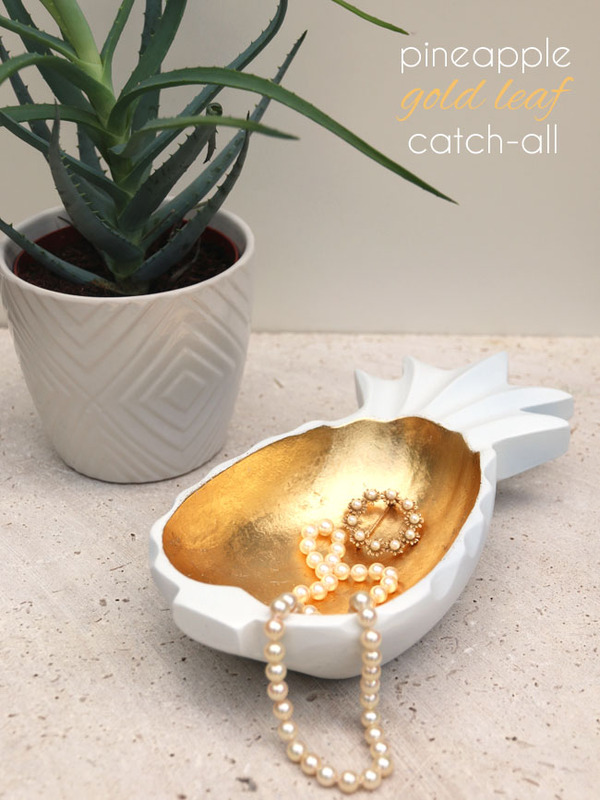 **tip: For a "solid" gold look like my bowl, evenly brush on the adhesive. For a "marbled" look, randomly brush on the adhesive, leaving some spots bare and randomly dot the adhesive in other areas. Now comes the fun, messy and unpredictable part… Applying the gold leaf! 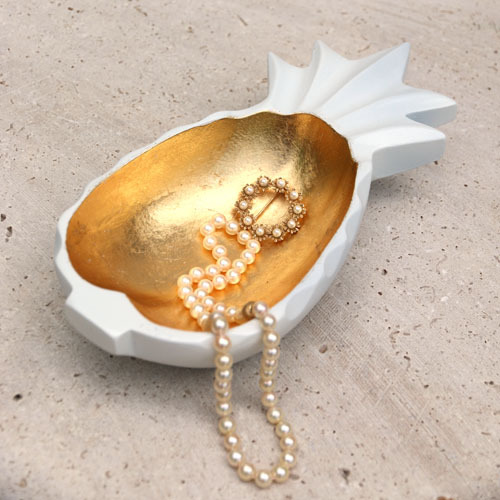 Be prepared for a little mess-- Gold leaf is thin and extremely delicate. Work in a draft-free area, away from vents and windows. I covered my work space with parchment paper to collect the gold scraps. 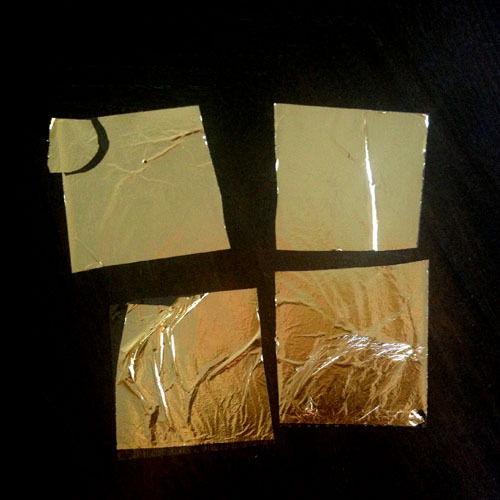 Cut your gold leaf to a manageable size, leaving on the attached tissue paper or plastic and try not to touch the gold leaf with your hands***. See the torn gold leaf (top left), that's what happens! For my small bowl, I found that cutting a sheet into 4 squares would cover generous portions without being unwieldy. Picking up the gold leaf by the attached plastic/tissue paper***, I then applied it as smoothly as I could to the interior of the bowl. Press the gold leaf onto the adhesive… it's hard to see, but there is a thin layer of plastic between my finger tips and the gold leaf. I repeated this with 5 squares without overlapping, then filled in the gaps with smaller pieces and gold leaf scraps. 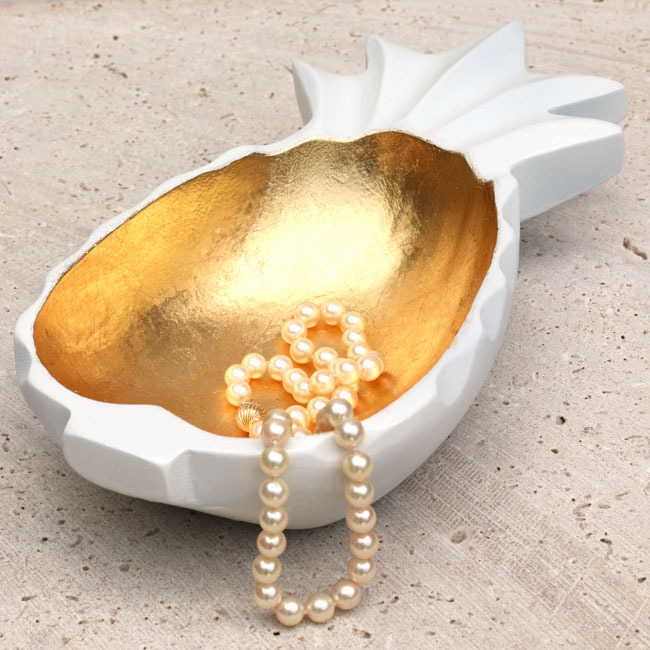 I ended up using 1.5 sheets of gold leaf to cover the interior of my bowl. *** tip: Avoid touching the gold leaf with your bare hands since it will adhere to the oils on your skin. Try to touch the attached plastic or tissue paper instead. Not always easy to handle, but doable if you are patient! I've seen other techniques like using a flat-edged paint brush or using a cotton ball with a little skin oil rubbed on to pick up gold leaf… If you have your own special technique, definitely use it! Time to clean it up and burnish the gold. Use a clean foam brush to remove any loose gold leaf. Then, using a piece of soft cotton, burnish the gold leaf, softly but firmly. Last Step! 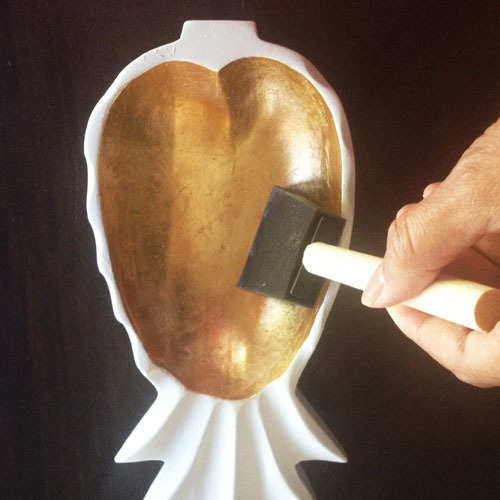 Using a clean foam brush, seal the gold leaf. Apply a thin coat and let dry. Then apply a 2nd coat. You'll definitely want to do this to protect the gold leaf from scratching-off and also, to prevent it from tarnishing-- copper and most gold leaf (except the highest K's) will eventually tarnish. 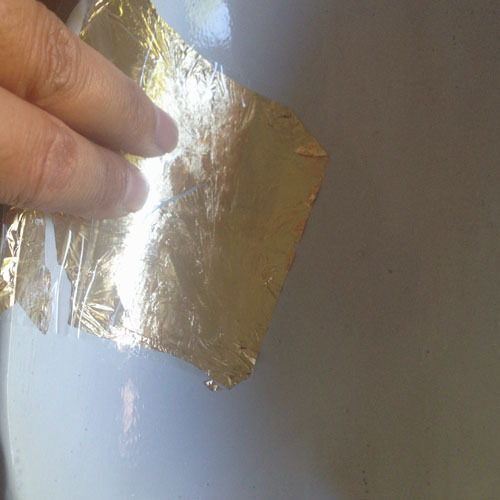 Choose your sealant wisely because it MAY change the color of the gold leaf. I erred on the side of caution and used the sealant that came with the kit. Smooth, shiny and the perfect table top bling.